(22nd Avenue, DIAMOND HEAD) Today, Gov. 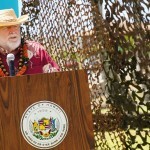 Neil Abercrombie joined by Maj. Gen. Darryll D.M. 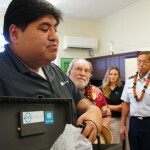 Wong, the adjutant general and retired Maj. Gen. Ray Starling, Hawaii Energy program manager, shared how Hawaii State Department of Defense, Hawaii National Guard division, reduced its energy consumption in some facilities by as much as 23 percent. Last July, as part of the governor’s reduction in dependence on fossil fuels initiative, Gen. Wong directed his staff to implement a plan to cut energy usage by five percent each year for five years cutting total usage by 25 percent by 2017. To date, the projects and behavior modifications throughout the National Guard’s facilities in Diamond Head area have resulted in an aggregate savings of $79,000 since to program’s implementation a year ago. Over the last several years, the Hawaii National Guard has worked collaboratively with Hawaii Energy, the conservation and efficiency program for Hawaii, Honolulu and Maui counties, to become more energy efficient. In summer 2012, partnering with Hawaii Energy, State DOD personnel were educated on energy conservation measures. More than 130 Hawaii National Guard staffers learned about conservation and efficiency in the workplace, including identification of wasteful lighting and air conditioning conditions. The ultimate goal is the adoption of institutional behavior change. In turn, these staff members applied the training to the facilities where they worked and shared their knowledge with co-workers. 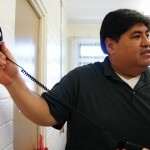 Many energy-saving opportunities were identified by the energy audits performed as part of the training. These range from space consolidation or optimization to no or low-cost operational changes to large-scale capital improvement projects. Hawaii Energy provided the training through Smart Sustainability Consulting, a Honolulu-based company specializing in occupant engagement through education. fossil fuels. Most important economic enterprise is energy independence. The teams received tool kits to measure power usage and light levels. Armed with an array of meters and tools, the teams surveyed power consumption of their respective facilities. Engineers from AEIM make recommendations, after measurements taken by the DOD teams are analyzed. Each team has assigned mentor who is experienced cutting an institutions energy usage. The teams were encouraged with statistics and success stories that illustrate how making small changes and changing the perception of things like proper lighting can have a massive impact on an energy budget. The diverse teams members left the training sessions ready to measure there facilities power usage, and with a deeper understanding of terms like watt, CFL, magnetic vs. electronic stabilization, Lumens, candle power and de-lamping. After data was collected over $50,000 of annual saving has been identified just in the Fort Ruger area. The two main areas that needed addressing were plug loads and lighting levels. The savings will come from simple relatively inexpensive adjustments like power strip usage, and adjusting the light levels in the rooms that are over lite. The figures do not include adjustments in the heating and cooling of the facilities, but those figures are being considered. Teams of building occupants around from the through out the Islands are slated to get the training and will start measuring their own facilities usage.